They say a swallow doesn't make a summer. 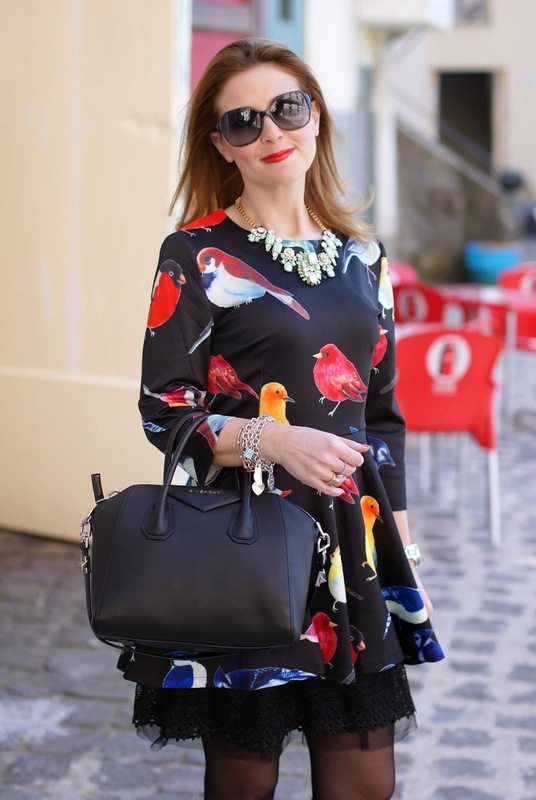 Well, not even a spring, and it's true...I've been to Sorrento for a few days, and in the South of Italy we had a quite cold weather, so maybe no swallows, only a few freezing pigeons...but we had other birds around anyway, colorful birds like the ones on this dress from Sheinside !. These pics testify a quick return of tights, but also an interesting new entry you can see scrolling the post: a very special little hat !. Si dice che una rondine non faccia primavera, ed è vero...sono stata a Sorrento per qualche giorno, ed al sud ancora tanto freddo, pertanto niente rondini, al massimo qualche piccione infreddolito...ma non erano i soli volatili in giro, c'erano anche quelli sul mio abitino nero di Sheinside !. Queste foto testimoniano il ritorno forzato delle calze, ma anche una new entry che vedrete scorrendo il post: un cappellino molto particolare !. 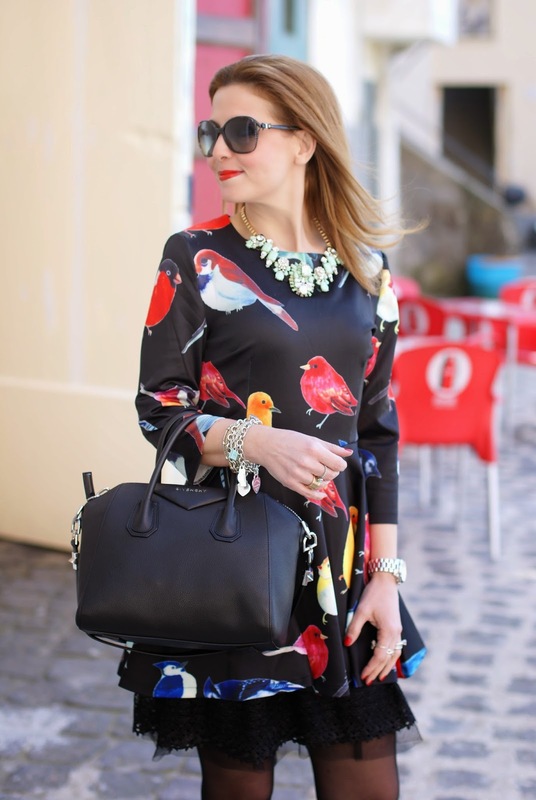 I fell in love with this Sheinside birds print flare dress as soon as I saw it, and when I received it I wasn't disappointed at all. I love the cut and the fabric, and the three-quarter lenght sleeves. The black background makes it suitable for day and night, and the colors of the birds are so bright and cheerful !. I wanted the full cut of the bottom part to be fuller, and I thought about wearing a sundress with tulle details as a petticoat underneath, I think it was a great idea, and also added a couple of inches to the dress ;) I bought also a white sundress like this one, thinking it could be handy with all these super short flare dresses, we'll see !. Mi sono innamorata di questo abitino svasato Sheinside non appena l'ho visto, e quando è arrivato a casa non ne sono rimasta affatto delusa. Mi piacciono sia il taglio che il tessuto, e le maniche a tre quarti. Lo sfondo nero lo rende adatto sia al giorno che alla sera, ed i colori degli uccelli sono davvero molto vivaci ed allegri !. Ho comprato anche una sottoveste uguale ma bianca, pensando potesse essere utile con tutte le gonne svasate che ho, vedremo !. I bought this beautiful mint statement necklace there in Sorrento, in a lovely shop called Unica Concept Store and had to wear it immediately, my collection of necklaces keeps growing and I can't help it !. I also bought, in the same shop, a lovely black and white basque hat...it's pretty unique and I couldn't wait to wear it. I love statement pieces and accessories that can add something special to any outfit. One of my dreams is to go to Royal Ascot with a very weird hat, this one is surely pretty normal compared to those you see there....but still pretty weird to my husband, LOL !. Anyway, let me introduce you to my little striped hat !. Ho comprato questa bella statement necklace color menta a Sorrento in un negozio davvero particolarissimo che si chiama Unica Concept Store. La mia collezione di collane continua a crescere e non riesco davvero a fermarmi !. Ho comprato anche, nello stesso shop, un adorabile basco bianco e nero...è davvero particolare e non vedevo l'ora di indossarlo, adoro i pezzi unici e originali e gli accessori che possono aggiungere un tocco speciale ad ogni look. Uno dei miei sogni è di andare al Royal Ascot con un cappellino molto strano, questo è sicuramente anonimo rispetto a quanto potrei fare, ma è già abbastanza strambo per mio marito LOL !. Dunque, vi presento il mio cappellino a righe !. With such a colorful dress, I chose to wear black pumps, from Loriblu, with little studs detailing. I will be surely wearing it again with sandals and no tights, but I can assure you that around Easter day it looked like winter !. Con un abito tanto colorato, ho scelto di calzare deco nere Loriblu, con piccole borchiette argento. Lo indosserò nuovamente di sicuro con sandali e senza calze, ma vi posso dire che nei giorni intorno a Pasqua sembrava più di essere in pieno inverno, mancavano solo gli zampognari, ahahahah !. 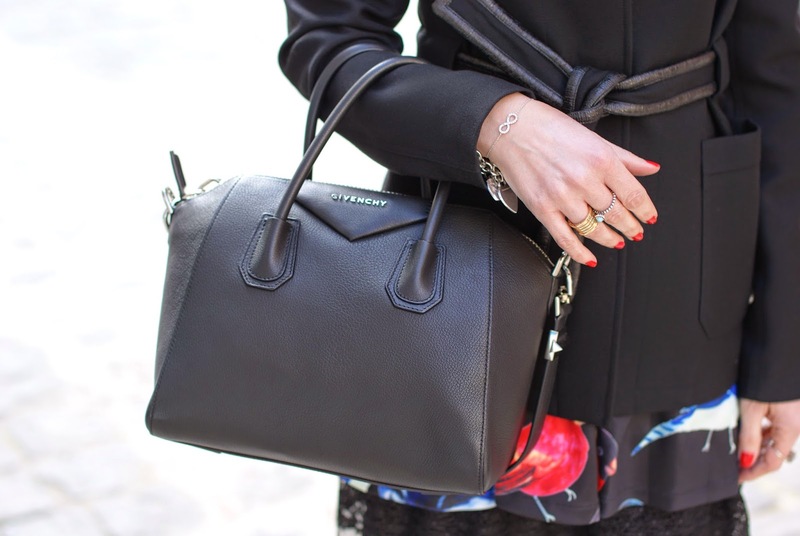 My bag of choice was my beloved Givenchy Antigona bag, that is one of my most treasured belongings. I love it so much !. It looks good on everything, really !. Fire red nail polish completed this slightly vintage look. Birds, striped hat, did I miss anything ? It sure was a fun outfit and a fun day that passed way too quickly, as it always happens when I am on a getaway ! After all, time flies !. La borsa prescelta per il look è stata la mia adorata Antigona Givenchy, uno dei miei "tesori", la adoro letteralmente e sta bene su tutto, davvero !. Uno smalto rosso fuoco ha completato questo look dal sapore vagamente vintage. Uccelli, cappello con fiori e righe, ho dimenticato qualcosa ? Sicuramente è stato un look divertente per una giornata altrettanto piacevole che è trascorsa, come sempre accade con le mini vacanze, troppo in fretta ! Oserei dire, per restare in tema, che è...volata via !. With this quick Giveaway, you can win a pair of Romwe black and white striped leggings ! This lovely Giveaway is open internationally until April, 27th ! Hurry up and click here to enter ! Troppo forte il cappellino a righe! :) Il vestito con questa stampa mi piace molto, anche per il contrasto di colore, e all'inizio pensavo che il sottogonna facesse parte dell'abito! Mi piace proprio l'insieme! Che classe con quel cappellino! Sei una vera diva, bellissimo look. Absolutely beautiful and classy outfit! Love your dress, it's one of a kind, very feminine and chic! I can't get my hands off of my Antigona either, it's one of my favourite bags ever. i love that dress! it's so gorgeous!! Carino il vestito anche se io non sarei così audace da indossarlo! Tu riesci sempre a sdrammatizzare un sacco di cose: mitica! Che bella la stampa di questo vestitino! What an interesting print. I like animal prints in general. Great dress. Looks nice on you. Yes, dear Vale ♥, your Givenchy Antigona fits indeed to every outfit I can imagine! And your dress - oh, it's so lovely - what a pity that the quote with the swallows turned out as true during you were in the South. Wish you really that you will be able to wear this wonderful dress for many other occasions when it's warmer, although I have to admit that I like it with the tights - and for sure your new hat, too! Wish you a happy start into the weekend my dear friend! muoiooooo solo tu potevi comprare quel cappellino .....e starci da dio! bellissimo anche il vestito e si vede che faceva proprio freddo!! This is such a fun dress and love your bag! Hello,Ciao...so charming look,your outfit is a work of Art! che creatività,che Stile, che Gusto nel vestire...che magia...Chapeau! Love the irony of this kind of print! E' da un pò che ho notato su internet questa stampa del tuo vestito e LA ADORO!! You are such a smart dresser! Not only is the bird-dress adorable, but adding the petticoat makes it even better. And those shoes... and tights... I wish I was you! Love this dress...it is fabulous!! Cherie, che look adorabile! Mi piace come guidi i lettori alla scoperta dell'outfit, raccontando i particolari e le curiosità di ogni pezzo...dovrei fare anche io così, è molto più personale e divertente da leggere! Parlando del look, che idea geniale la sottoveste! Seriamente credo che ti ruberò l'idea, perchè io sono una watussa e tutti i vestiti mi stanno corti..questo è un ottimo metodo per recuperare un po' di lunghezza! Il baschetto l'ho già commentato su IG e speravo fosse reperibile online da qualche parte, invece è una conquista da boutique locale...sigh! Ottimi acquisti comunque...a prestissimo e buon week end! il trench strizzato in vita è un must che adoro. Ma che bello l'abito e il cappellino è originalissimo! Un bacione e buon week! Bellissimo questo outfit e adoro il tuo cappellino. Come ti comprendo per la passione delle statement necklace. io non so più dove metterle! Carinissimo questo avito, bella anche l'idea dell'aggiunta della,sottoveste che dona più volume e stupendo quel cappellino! OMG this dress!!! You are just too cute!! Your necklace and bag are my favorites from this outfit! Love the print on your dress! At least we can be reminded of warm weather! Nooooooo che carino il cappellino, molto originale ed è perfetto per te!!! L'abito è adorabile, poi tu sei un genio perché la sottoveste ci sta benissimo, lo rende più femminile e glamour :) Sto sbavando per la tua borsa ahaha! Che bella idea quella della sotto-gonna in tulle, mi puoi dire dove l'hai trovata? E quanto è carino quel cappellino! Il rossetto e lo smalto danno risalto ai colori vividi dell'abitino, che è una delizia. Sei sempre splendida davvero! 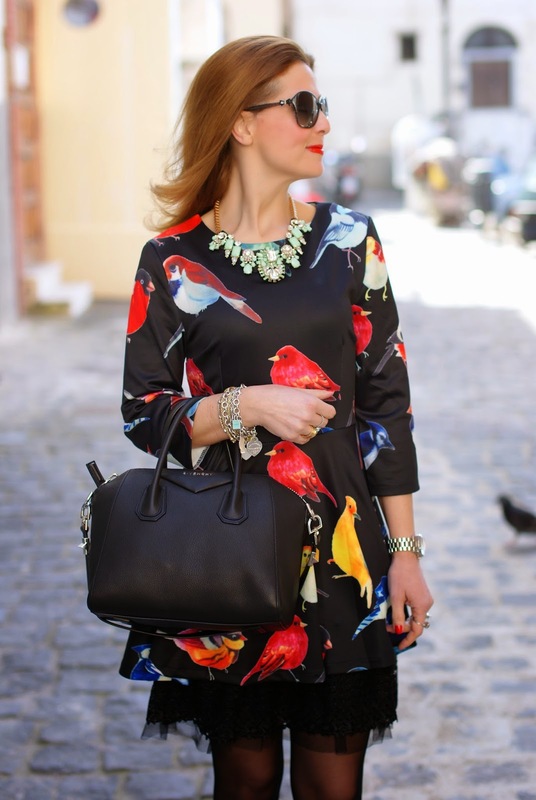 The birds on your dress exudes a vintage feel. It looks so bright and cheery yet amidst the black, it reverberates a sense of mystery. I like how the inner petticoat added length to the dress, otherwise it does seem a little short. The hat is so cute. You're from Italy? I visited Venice, Florence, Rome and Milan last summer and I love Italy! Wow wow wow I'm officially in looooove with that marvelous bird dress and the cute petticoat!! You look so classy and stunning!! That is one of the most beautiful dresses I have ever seen. It is such a happy, pretty, colorful print. The style of it is so lady-like too. The addition of the hat and that sparkly necklace was stellar. You look so elegant Vale. Stai benissimo, mi piace molto questo abito con questa stampa! You are great and I love your style! I just discovered you from share in style, greetings from Spain, dear Lady! Yo look beautiful and stylish loke always dear!!! Questo cappellino è fantastico! Particolare come l'abito, mi piace tutto! 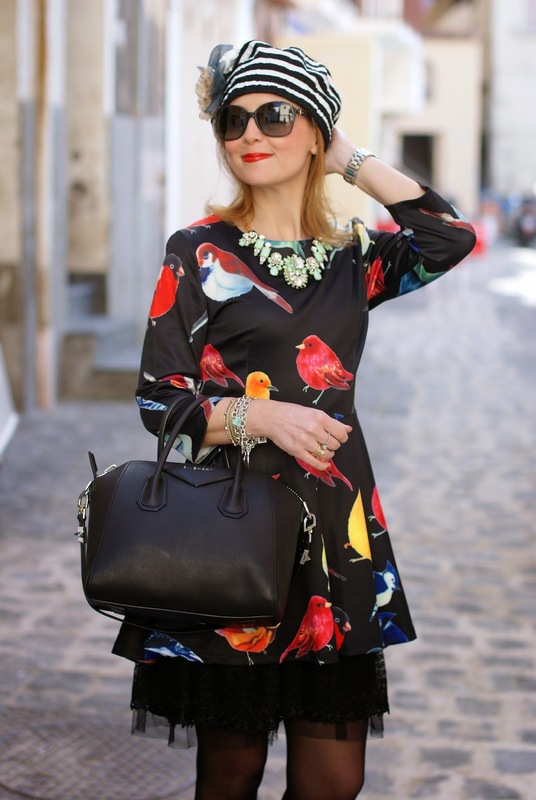 beautiful bird print that enhances your always gorgeous beauty. Thank you sooooooooooooooo much for joining the fun, dear Vale.